Mmmm-minty with a hint of fresh ginger. Our out-of-the-ordinary but oh-so-refreshing Mint and Ginger Lemonade recipe starts with a fresh mint infusion, but in a pinch you could certainly use mint tea bags instead. This tasty twist on traditional lemonade makes 12 quarts, so it's perfect for serving a thirsty crowd at your next backyard BBQ or summer soirée. In a large saucepan, bring 3 quarts of water to a boil. Add the mint and ginger and let steep for 40 minutes. Strain and stir in the honey, lemon juice and remaining 5 quarts water. Chill. 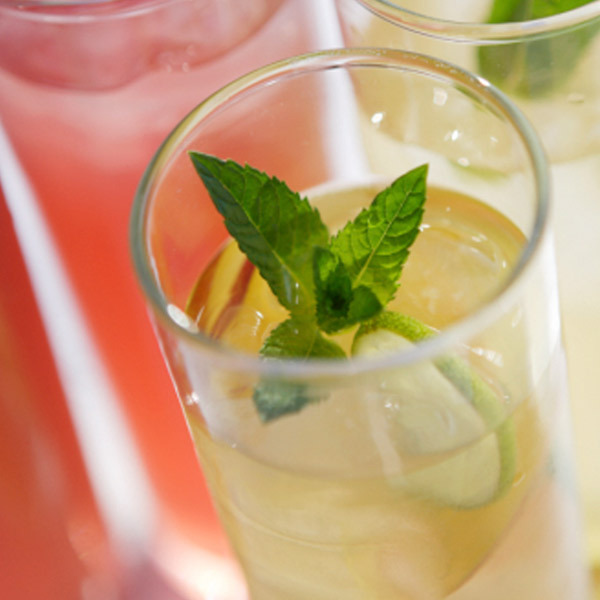 Serve over ice, garnished with fresh lemon slices and mint sprigs. Tip: Mint tea bags can be steeped in place of the fresh mint.